Now that the NBA playoffs have begun the regular season TV viewing rule, “you only need to pay attention to the final five minutes”, has been eliminated as every possession is contested with pressure defense. Yet due to marathoning’s linear rather than episodic nature, where there is no shot, pitch, play, etc. every 30 seconds, or quarters, periods, innings or halves to break up the action, the sport of long distance racing is a hard sell to an ADHD audience. This is especially true when very few of the athletes have been marketed as individual stars to the non-running public, and where, by comparison to other sports, the stakes are quite low. In the face of these circumstances to then control the action via pacesetters only serves to further separate the average viewer from the game, as there is no reason to become engaged until the “real” action begins after the controlled first half. In London this weekend we have another of the “greatest fields ever assembled”, both on the men’s and women’s sides, with thoroughbreds striding along the Thames everywhere you look. Yet once again there will be a host of pacesetters ready to take the men through the first half in a rapid, but controlled 61:45. Earlier this morning I Tweeted the following, which began a short give and take with my friend and colleague Ed Caesar, whose new book Two Hours: The Quest to Run the Impossible Marathon will be released July 16, 2015 by Simon & Schuster. If #LondonMarathon has the greatest men’s field in history (again), why do they insist on racing for only half the distance? @edcaesar Then why have pacers in the first place? Or, create teams: one guy is the lead-out, 2nd guy is set-up, & the star is the closer. The reason pacesetters are valuable is because they eliminate the guess work, making clear to both the racers and the audience that nothing will happen of import until the pacers’ assignments have been completed. On occasion such an arrangement can be very compelling. But not if it is employed every time out! In the wake of Meb Keflezighi’s emotional win at the 2014 Boston Marathon — where Meb and Josephat Boit broke away from the main pack in mile 8, ran together till 17, before Meb pulled away to open a 1:20 lead on the main pack at 30Km, only to see that lead get whittled down to a mere six seconds with one mile to go by Wilson Chebet — we had one of the most emotional rides in modern marathon history, a ride that transcended their finishing times. So, too, in last year’s women’s Boston — or in New York City 2011 or 2013, for that matter — where Boston-area native Shalane Flanagan pushed hard from the gun trying to break free from her opponents, only to come up short on Heartbreak Hill, we had a compelling challenge mounted way earlier than usual, leading to tough decisions and hard choices for the other competitors, and growing intrigue for the viewing public. A paced race eliminates all those decisions and choices. Either you can run that proscribed pace or you can’t. Nobody, in fact, is racing, rather just running fast and holding on. 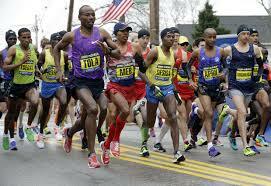 If Boston 2014 had been a paced race, you can be assured that Meb would not have won that race! Last Monday in Boston Ethiopia’s Tadese Tola lit out of Hopkinton at the sound of the starter’s gun like he was late for a parking meter violation in the Back Bay. It soon became evident that the Ethiopian contingent had devised a plan to attack early, as eventual champion Lelisa Desisa, runner-up Yemane Tsegay and Gebre Gebremariam all shared the load with Tola into a biting headwind. It wasn’t until American Dathan Ritzenhein took the lead at halfway (1:03:58) that we saw someone other than an Ethiopian in front. Aficionados couldn’t remember the last time an Ethiopian four-pack had led out a group of Kenyans through the first half of a marathon. It was the opposite tactic normally employed by the sit-and-kick Ethiopians, and gave we commentators plenty to talk about and the audience reason to keep glued to the screen. That’s what a non-paced race offers, intrigue. Tactics emerge rather than being imposed. Not that a paced race can’t be exciting. London almost always is thrilling, but thrilling in a less organic way. Yet at the London Olympic Marathon in 2012 one of Sunday’s favorites and defending champion Wilson Kipsang opened an early race lead, only to get reeled in by Stephen Kiprotich of Uganda and fellow Kenyan Abel Kirui. First halves can matter, especially when portent is high. How did this total focus on fast times become the norm in this sport? We can trace it in the modern time back to Roger Bannister’s initial sub-4:00 mile in 1954. Bannister, Aussie John Landy and American Wes Santee were each pushing to become history’s first sub four-minute miler. On May 6th at the Iffley Road Track in Oxford, England future Commonwealth Games gold medalist Chris Chataway and future Olympic steeplechase champion and London Marathon founder Chris Brasher set the long-legged Oxford medical student up through three laps as Bannister broke the four minute barrier in a lunge at 3:59.4. The sport has been hooked on pacers ever since. But with many of the sport’s recent distance times under scrutiny in ongoing doping investigations, isn’t a time goal less appealing than a compelling full distance competition? To increase its appeal, any sport must be built around its personalities, not its records. Completely agree. By incentivizing a fast race, whether through rabbits or half-way bonuses, race directors tamper with the outcome of the game. The MLB does not incentivize David Ortiz to hit home runs and the NFL does not incentivize Peyton Manning to throw touchdowns- or Marshawn Lynch to run them in. These sports know that if they do so, they compromise the possibility that Big Papi bunts to bring in the winning run on third base, or that Russell Wilson throws an interception at the goal line of the Super Bowl, prompting much more intrigue as well as ensuring a fair game. Race Directors should be providing environments for creativity, drama and strategy. If people watch sporting events to view history being made, track and road racing are backing themselves into a corner by focusing on breaking time records. If we build environments for creativity within races, we move our sport from tic-tac-toe to chess. Let’s be chess. Well said, Jeff. Let’s discover the Kings, Queens, Rooks, and Bishops rather than the bottle caps (that’s what we used as kids for checkers). kudos for the team idea! that would be a thriller. I’ve never watched the marathon in the Olympics but perhaps this has been on some level or another there? Why there aren’t team medals for the Olympic Marathon is beyond me. Great post, Toni. I’m a little split on this topic. I completely agree that non-rabbited races provide the most enjoyable and oftentimes intense viewing experience. Another great example was New York 2011 (which I ran), where Mary Keitany obliterated the field in the first half, as if out to challenge Paula Radcliffe’s world record, and then got caught by Firehiwot Dado and Buzunesh Deba in the last 5k. However, I can see the appeal for rabbits in one very crucial component of running: PRs. This, of course, is obvious – rabbits are there to produce fast times, course and even world records. But the reason for their popularity might stem from the average person’s interests. While sports are flush with statistics and no shortage of analysis, running for the middle-of-the-pack runner is less about winning or outmaneuvering your competitors, but against besting your own times. So for me, the rabbits are there to challenge the Chicago Marathon’s PR, or the London Marathon’s PR, as if the race itself were a runner, striving to improve on its own best. This might be a little whimsical, but it’s how I justify having the pros out there doing the hard work. That said, I do wish they’d drop out at half and not at 30k like many do. Toni, you took the words right out of my mouth. I couldn’t agree more. I also fear that the sport’s growing sub-2 obsession will only encourage doping cheats as the race against the clock becomes more lucrative. When I watch paced races I find myself wishing the rabbit would pull an upset win like last year’s Olomouc Half. Now THAT would be an exciting paced race to watch. Otherwise, I’ll take Boston & NYC any day. Let Dubai and Berlin be the paced marathons each year as they are built for that format. But in order to be an Abbott World Marathon Major, an event would have to be an un-paced affair, as discovering the best marathon racer is a different investigation than determining the fastest marathon runner. Also, each Diamond League track meet could designate one male event and one female event for a record attempt that includes pacers. But every Diamond Race would have to be un-paced. I think it’s the only way to grow a fan-base.